Next week? Pretty short fuse. I'm not sure how you capture it for playback. Good luck, and good on ya! If it was strictly a wanted ad then it should go in the "Wanted" Forum. However seems it went technical when we opened the discussion of how to play it back. Mike, I assume when you said play it back thru your radio speaker, you meant a civilian radio speaker and not a military radio set? Wes, I’m hoping to figure out how to use the speaker that plugs into the military radio in my Jeep. Knew it was short notice. This is something I’ve wanted to do for a while and when this came up over the weekend I decided to get off my tail and get it done. I’ve downloaded some audio onto my IPAD but can’t figure out how to get enough volume for it to be heard. Thanks for all your help. I really want this event to come off well. Ah, the difference between obsolete old military radio analog audio and digital audio. Probably need an amplifier, and likely modify your military speaker. Why not just stick a small iPod speaker behind the military radio speaker and throw some camouflage over it? Plan B: 8th graders are pretty sharp. They'd figure out how to do it in a heartbeat. Pads and phones generally do not have the power to drive speakers, just buds and the like. I assume you are talking about the standard fare square Military box speaker? They are generally 8 ohms which is good as it is standard. Unfortunately a lot of those speakers have a transformer in them to convert the output of the Military radios to the speaker. You could try; open the speaker case, disconnect one lead going to the speaker. That takes the transformer out of the equation. Hook the two wires from your pad directly to the two lugs on the speaker. It just may have enough volume for you, but its a toss up. What really needs to be done is get one of the small audio amps on a small circuit board and use it to drive the speaker. Most will fit in the speaker enclosure, but you need a source of power. It can all be done fairly easily, but your time frame is very short. It sounds like an interesting quest. Let us know if/when/how you make it work. I might be interested in doing something similar. I use a Bose rechargeable wireless speaker and my cell phone connected wireless . The sound is great and it is small enough to fit almost anywhere. You can use it with you IPad too. I use a couple of different items to give sounds when I have a display set up. 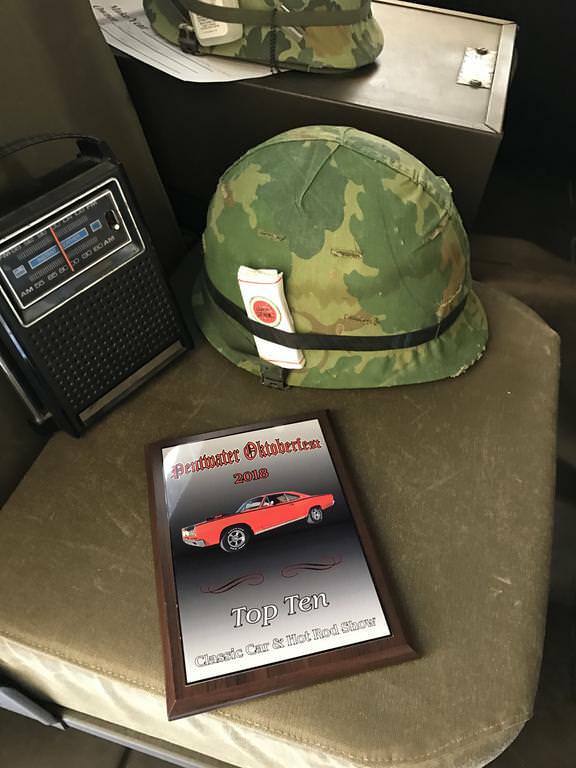 For military radio chatter, I used my old outdated Iphone and made a playlist with several pieces of radio chatter that make about an hour and a half of chatter. I have an older Magpul phone case for it that is OD green, so I slip it under the radio between the radio bottom and the mounting tray near where the speaker is. And I just play it through the phones speaker which give it an old school muffled sound. This gives just enough sound that when you are standing near the vehicle you can hear it, but not so much as to bother others displaying at the show. The other I use is an old transistor radio that I gutted and installed an MP3 player and a rechargeable speaker. I can access them through the battery cover to plug them in to recharge. On the MP3 player I made a playlist of period rock music and spaced them out with old original AFVN jingles and PSA's that I had found somewhere on the web years ago. This makes for some great background music for the display. Thanks for all the replies. I’ll let you know what I do. The poster suggesting the bluetooth speaker is on the mark IMO. Battery powered speakers are relatively cheap right now. You can hide one close by the radio speaker and play audio through it that way. Or get a spare military speaker set, take the insides out and put the bluetooth speaker inside.